Get the smile that you have always wanted with the expert team at Thompson Dental Care Inc. We can't wait to help you! We offer different services to meet your needs. Dr. John B. Thompson, DDS was born and raised in Kendallville, Indiana, and graduated from East Noble High School in 1978. He attended Indiana University and graduated with a BS in Biology in1982. He then graduated from Indiana University School of Dentistry in 1986 and joined his father in practice at Thompson Dental after graduation. Dr. Thompson is a member of the IKDDS-Isaac Knapp District Dental Society, the IDA - Indiana Dental Association and the ADA - American Dental Association. He is married to wife Diane and has four children, a daughter-in-law and one grandchild. 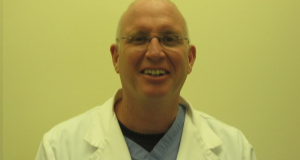 Dr. Thomas Jones, DDS is originally from Fort Wayne, Indiana. He graduated from Homestead High School in 2002. He then attended Indiana University in 2006 and graduated with a B.S. in Biology and minors in both Chemistry and Psychology. 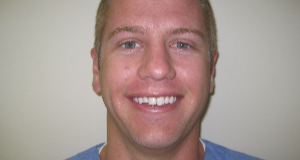 He continued on to IU Dental School and graduated in 2010. Dr. Jones joined us in July 2011 and is currently a member of the IKDDS, Isaac Knapp District Dental Society, the IDA, Indiana Dental Association and the ADA, American Dental Association. He enjoys spending time outdoors fishing and camping. A: A soft toothbrush with a small head is recommended because medium and hard brushes tend to cause irritation and contribute to recession of the gums, and a small head allows you to get around each tooth more completely and is less likely to injure your gums. It's unnecessary to "scrub" the teeth as long as you are brushing at least twice a day and visiting your dentist at least twice a year for cleanings. A: These are restorations to repair a severely broken tooth by covering all or most of the tooth after removing old fillings, fractured tooth structure, and all decay. The restoration material is made of gold, porcelain, composites, or even stainless steel.